Pizza Dip - Pastorelli Food Products, Inc. 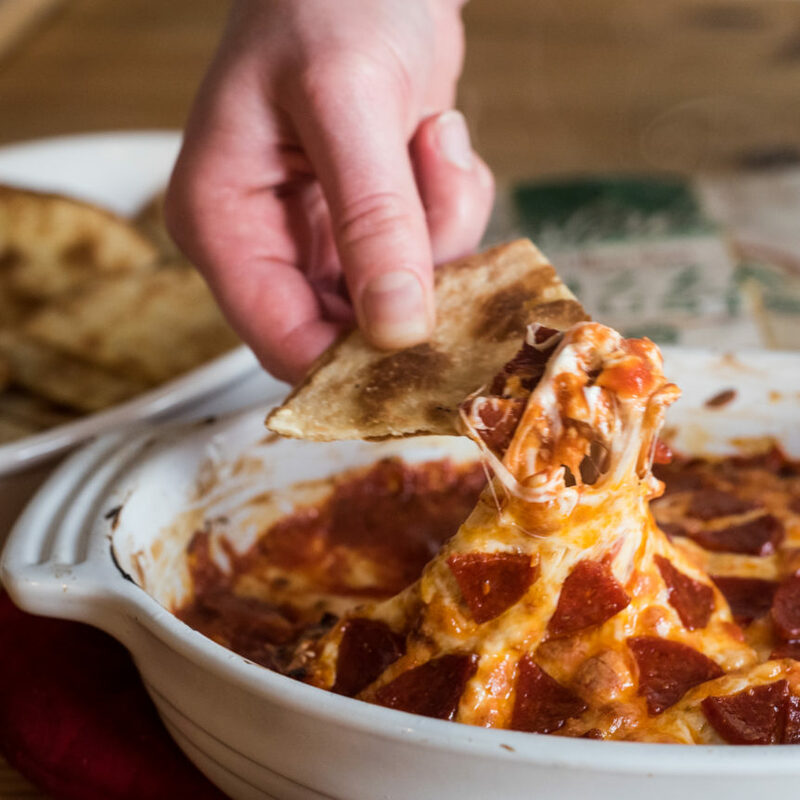 This pizza dip combines the best of both worlds. Using our ultra thin and crispy pizza crusts as crackers for dipping gives them the ultimate crunch without sacrificing the richness and flavor of Pastorelli pizza sauce mixed with oh-so-much cheese! Simply layer cream cheese with pizza sauce, mozzarella and top with pepperoni. Perfect for a potluck, party or a game-day, this dip will be popular with any crowd. Preheat oven to 400 degrees. Start by mixing the cream cheese with garlic powder and Italian seasoning. Feel free to substitute basil, red pepper flakes, oregano or any other spices you prefer. Spread the cream cheese mixture in the bottom of a casserole dish then spoon a hefty layer of Pastorelli pizza sauce (don’t be shy!) over the cream cheese and spread evenly. Sprinkle a layer of mozzarella on top of that and then top with pepperoni. If using a larger pepperoni, slice into smaller pieces so that it’s easier to dip. Bake the dip for 15 minutes. Meanwhile, brush the pizza crusts with olive oil and minced garlic. Place them on a separate rack in the oven and bake for 3-4 minutes. Pull them from the oven and slice into sixths then toss in a dish for serving. After the dip has been baking for 15 minutes, place under the broiler on high for 2 minutes, until cheese is golden brown and bubbling. Serve with the garlic crisps and enjoy!